1. Use Bud Blake as a template. A couple of years back an unknown Independent, with deep support from conservatives throughout Thurston County, upset a sitting county commissioner. How did Bud Blake do it? Basically, in every precinct in Thurston County, from the most liberal to the most conservative, he used the Independent brand to beat the average Republican vote just two years before. In fact, some of Blake's best returns vs. a stand-in Republican average came in some very liberal districts. The short lesson of Budd Blake in 2014 in Thurston County: party ID can mean a great deal to voters. And, people like the idea of an independent. It seemed that there was a group of voters that didn't like the idea of voting for a Republican, but were plenty happy to vote for someone who acted and talked like a Republican, but called himself and independent. 2. Bill Bryant is not locked in as a Republican. He has until the filing deadline on May 20th to lock in his actual party preference. 3. Bryant could use the Top Two primary to build a financially formidable independent campaign. And because Washington uses a Top Two primary, Bryant doesn't actually need to be affiliated with a major party to move along. He simply needs to build a financially stable campaign and build his name recognition statewide to get through the primary onto the general election ballot. And, Bryant has raised $1.4 to Governor Jay Inslee's $4 million. So, at least he's in the ballpark. The problem is timing. The May 20th deadline for filing is just four days before the Presidential primary in Washington State. If Trump is predicted to win the Washington Primary, would Bryant buck the tide of Republican primary voters? 4. Organized Republicans aren't exactly running towards Trump. The Democratic Party in Washington State ready to tar him with his party's presumptive standard bearer. But, it seems like a lot of Republicans are trying to keep their distance from Trump. No doubt their reticence was influenced by the polls and prognostications that a Trump candidacy could have a damaging domino effect on them and other GOP candidates. The theory is independent voters will be turned off by Trump and vote for a Democratic president, then continue voting against Republican candidates down the ballot. An Elway Poll released earlier this month found 55 percent said they would vote against a congressional candidate in Washington who endorsed Donald Trump. Although the poll didn’t ask about candidates for state offices, Democratic Party operatives drool at the possibility of a coming landslide of victories in legislative races. At every opportunity, they are pressing Republican candidates to reveal their presidential choice. “If you’re a member of the Democratic Party state committee, every Republican candidate’s middle name is Trump,” pollster Stuart Elway said. Unless of course, Bryant doesn't end up becoming a Republican candidate. So, possibly Bryant could still raise money from conservatives not hung up on party names. And, even though I doubt the Thurston County Republicans were super happy Bud Blake spurned their party, conservatives in the county still gave him enough to win. So, here's the crazy thing, and I admit this doesn't exactly make sense, but what better way to show that you're surfing into the anti-establishment wave by dropping your major party identification? Even when the party is nominating the establishmentarian-in-chief? Bill Bryant is such a rebel, he's going to rebel against the rebel. Here's one last sort of bonus thought. Between Republicans, Democrats and Independents, what is the largest political group in Washington? 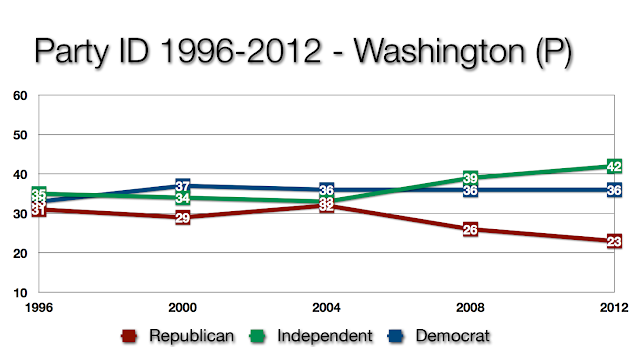 According to a 2012 poll (I know, four years ago), the largest group is Independents. And, that number has been growing steadily since 2004. They've actually been in first place in Washington State since 2008 and in the mix since the start of the poll period. More importantly, actual Republicans only made up 23 percent.